This is a real wall in Mexico, paid for and built by Mexicans. To say it’s solid is a dramatic understatement. This wall doesn’t exist to keep people in or out. It serves as an integral part of a building’s structure. This is what every other wall in the world is intended to do. The secondary role of this wall is to facilitate the telling of stories. 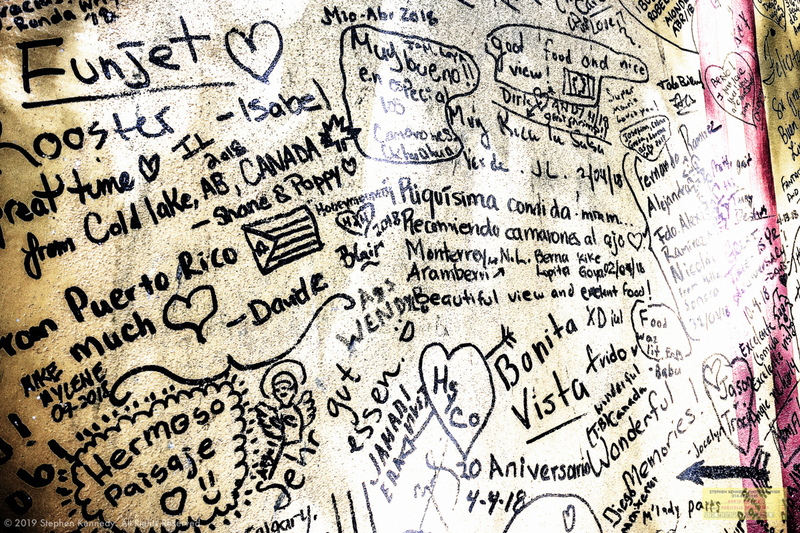 In this place, satisfied customers share their thoughts about the cuisine of this Jalisco cafe. If there’s anything wrong with this wall, it’s that it’s too small to hold all the positive testimonials written in numerous languages. The ingenious owners of this cafe have solved their “wall scarcity” and “word surplus” problem in a very creative way with a monthly coat of paint. That’s a smart solution from a great neighbor.